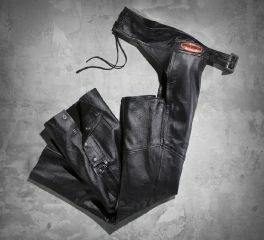 Safe and comfortable, Harley-Davidson's selection of women's leather motorcycle pants are just what you need for your next ride. Chaps that fit like a glove. With power-stretch, lacing, stretch thigh/knee, cuttable hem, AND dual zip, the Deluxe II Leather Chap offers a custom fit. 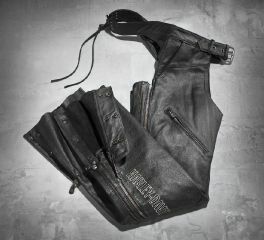 Graphics on these women's motorcycle chaps are intentionally minimal to coordinate with any jacket. Fit & Mobility: Buckle closure. Power-stretch back waist and adjustable lacing. Double zipper leg with four snaps. Cuttable hem. Stretch inner thigh and back of knee for comfort and fit. Inner knee darts for less bulk. Design Details: Engraved buckle. Metal badge. Midweight cowhide leather. Polyester mesh lining to knee. It's all about custom work, right down to the motorcycle chaps you wear. Consider the lightweight Essential Leather Chaps a blank canvas to create your own design with rally, reunion, and event patches. Soft, yet durable, the goatskin leather is an ideal material to block the elements while riding to your next meetup.